Are you thinking about marketing your innovative device in Japan? If so, you should know that the Pharmaceuticals and Medical Devices Agency (PMDA) has specific clinical data requirements for certain devices. Determining the clinical data requirements for your device can be challenging. Failure to comply with these requirements can significantly delay the registration process and incur additional costs. When is clinical data required? How do we consult with the PMDA to determine requirements for my device? What type of PMDA clinical consultation do we need? 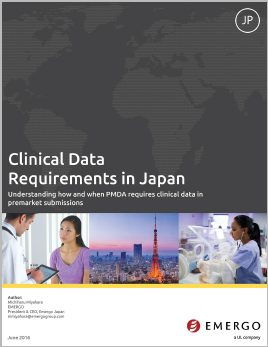 Will our foreign clinical data be accepted by the PMDA? How is our clinical data evaluated during the GCP Conformity Assessment? We'll answer all these questions and more in this 8-page white paper. Michiharu Miyahara is President & CEO of Emergo Japan. Mr. Miyahara has more than 15 years of experience with quality assurance and regulatory issues facing medical device manufacturers selling in and outside Japan. He previously served as the Director of the Regulatory Affairs and Quality Assurance Advisory Service Group at KPMG in Tokyo, a consulting division he started within the company in 1995.